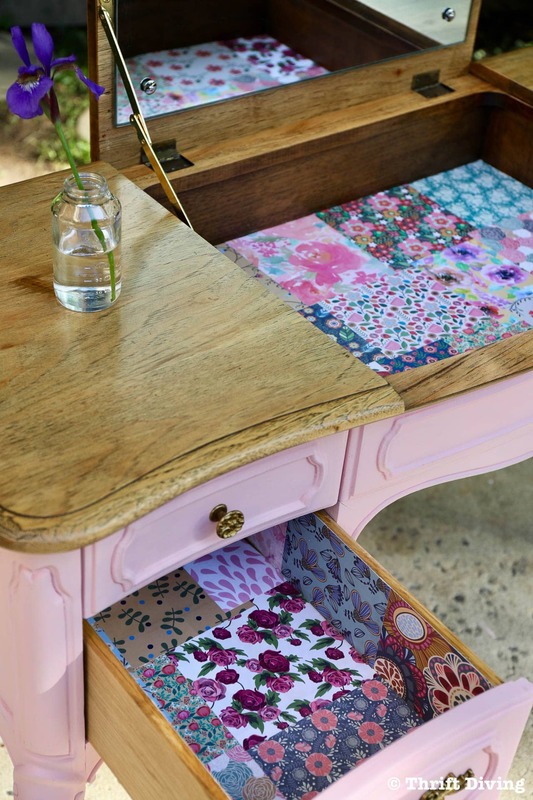 You are here: Home / Furniture Makeovers / Tables & Desks / French Provincial Vanity Makeover: BEFORE and AFTER With Paint and Scrapbook Paper! 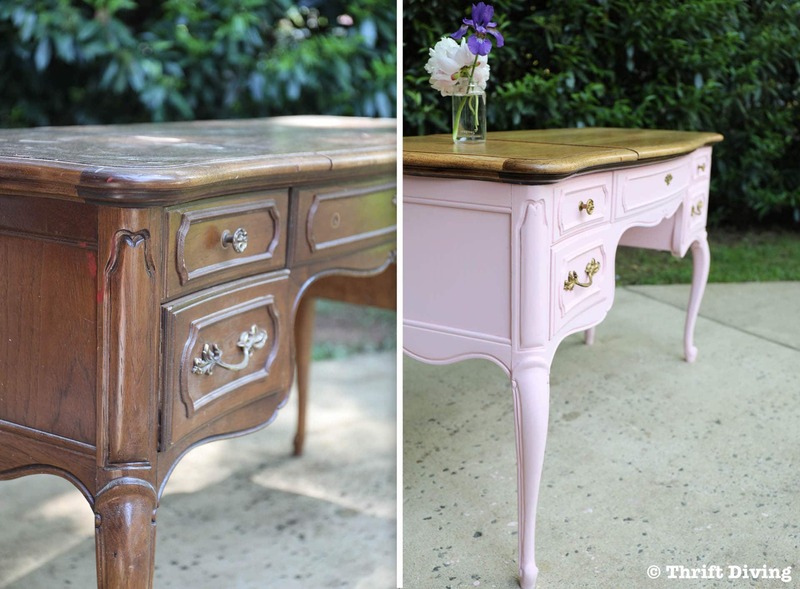 French Provincial Vanity Makeover: BEFORE and AFTER With Paint and Scrapbook Paper! 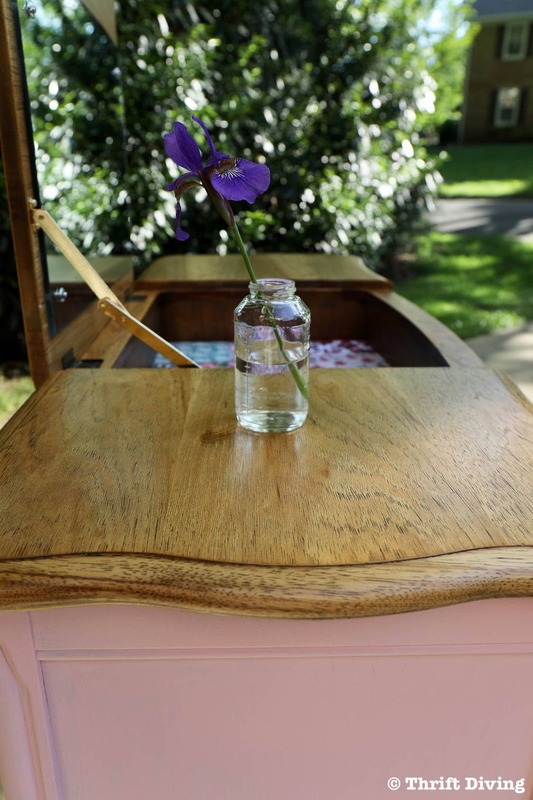 It feels like forever since I have done a proper furniture makeover, so I’m feeling very giddy with my latest project: a French Provincial vanity makeover! 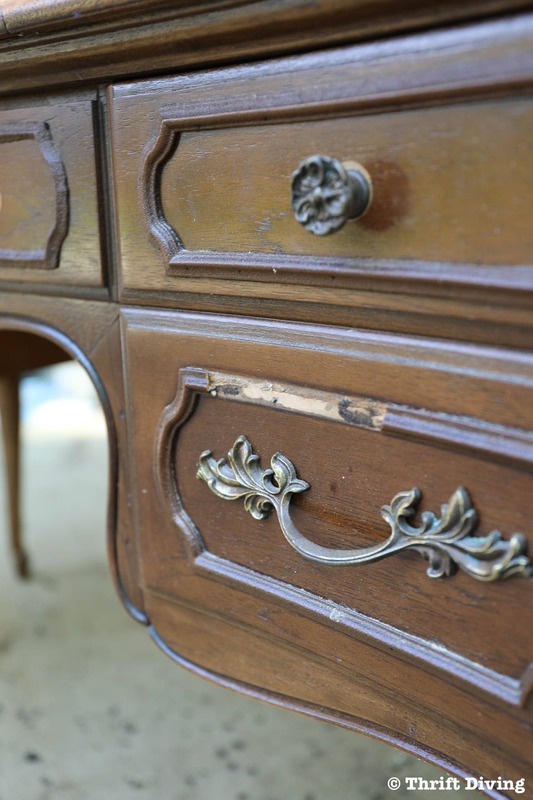 If you recall, exactly a year ago I found this beautiful French Provincial vanity at the thrift store for under $10. That is freakin’ insane. No joke–under $10! This beauty was hidden behind some other pieces. I gasped, grabbed an employee, and nearly choked when they said it was about $12.00. 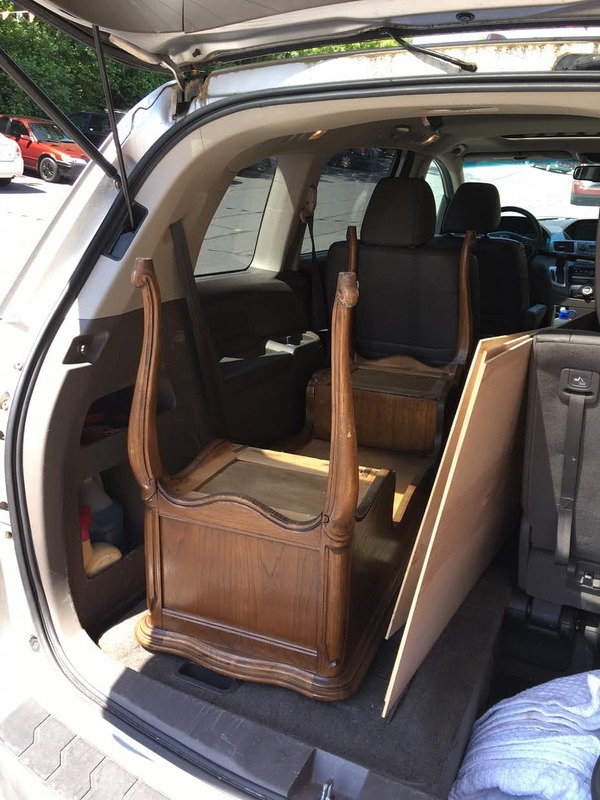 Of course, with a coupon, I drove away feeling like I have won the lottery, paying only $9.67 for the vanity! The lines were so beautiful. I debated on how I should refinish it. 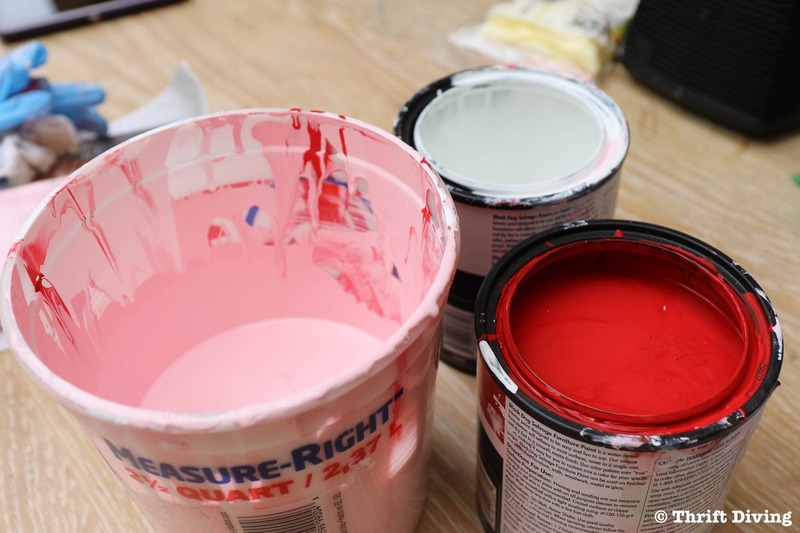 I asked my Facebook friends and they were also split down the middle: strip and re-stain……vs……paint it. The reason I couldn’t decide is that the more I understand and learn about wood, the more hesitant I am to just slap a coat of paint on a piece of furniture. Wood grain has grown on me, so to cover up “good wood” as I like to call it, seems like a travesty. Especially pretty oak like this. But you’ll see why in a bit why I decided to do a mix of stripping and painting. Let’s talk about materials, shall we? But first, if you’re a visual learner…..here ya go! 😉 Remember to subscribe to my YouTube channel for more videos! 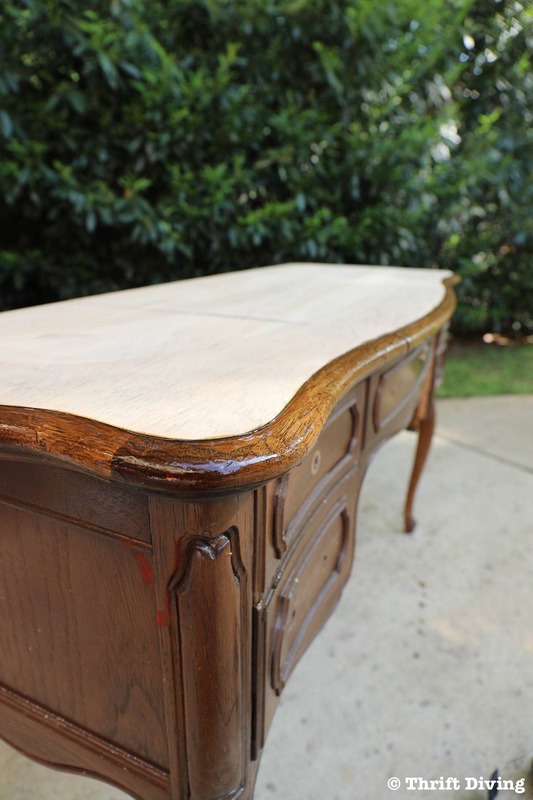 Watch This French Provincial Vanity Makeover in Action! 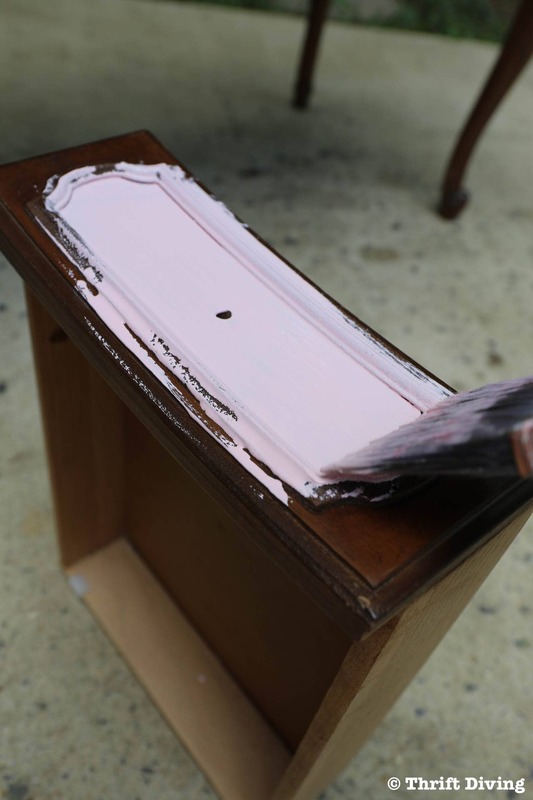 Let’s walk through the steps of how to paint a piece of furniture and my thought process behind this French Provincial piece of furniture. 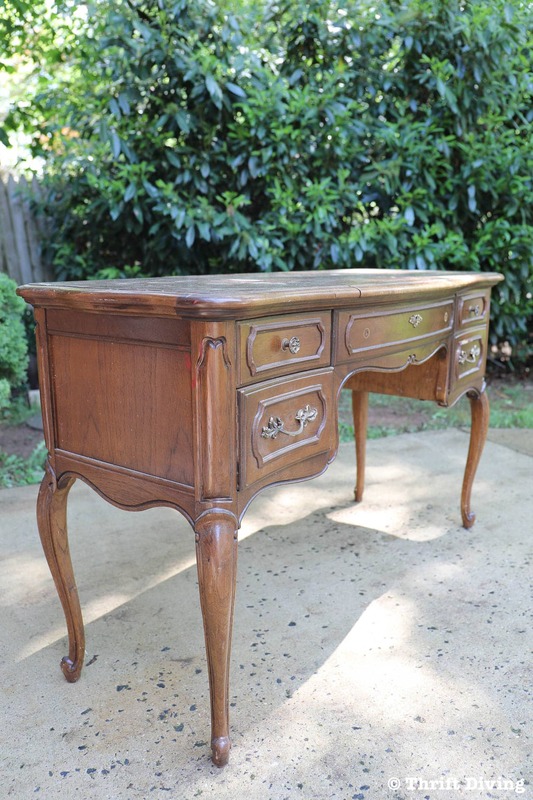 STEP 1: Inspect the French Provincial Vanity. Is There Damage? When I refinish furniture, the first thing I do is check to see if there’s damage. Then I check to see if it’s damaged and if I can repair it. 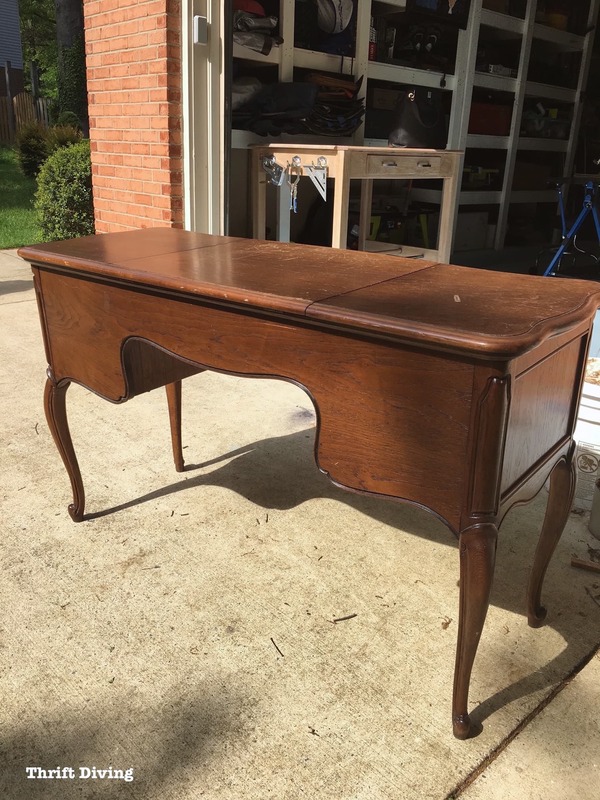 With this vanity, it did have some damage to the trim of the drawer, plus the top was scratched and had some marks on it that looked like they weren’t “sand-outable.” (Is that even a word….?). In the past, I’ve been notorious for painting some dirty furniture. Can you believe that?! I’d be too lazy to paint it. But that’s not the case anymore. I always wipe things down with a mix of vinegar and water, or I’ll use Simple Green, then wipe off the Simple Green. 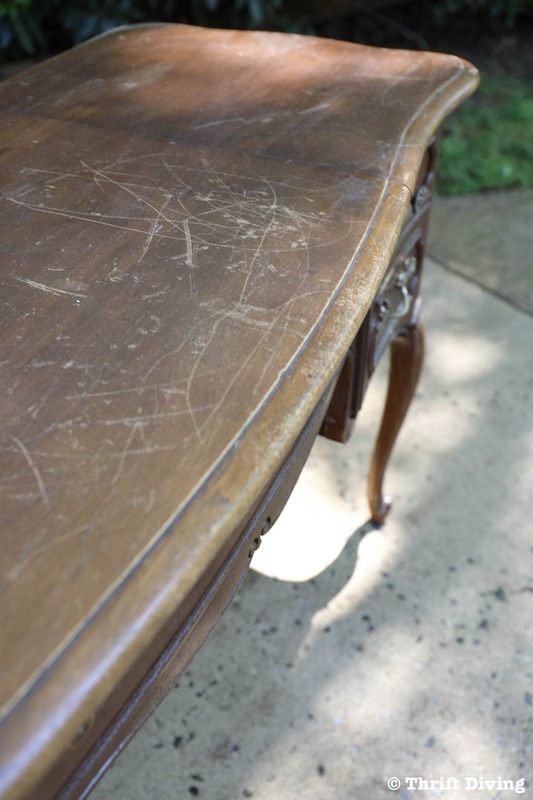 The other problem you’ll find with furniture is that it may have holes or cracks that need repaired. Or, sometimes a knob is missing and instead of finding a replacement, you simply fill the hole with wood filler. I had to do that with this vanity. In this case, I also had broken trim. I didn’t know how in the world I was going to fix that. I mean, I could go and buy new trim, but if you’ll notice, this old trim was bumpy and rough. Whatever trim I could possibly buy at a hardware store would be smooth. The different would be noticeable. I happened to find some Sugru moldable glue in my toolbox and–voila!–I was able to shape it into something that somewhat resembled trim! I ended up letting it dry for 24 hours and then used an oil-based primer on this moldable silicone so that I could paint over it. Otherwise, paint wouldn’t have stuck to it. I love stripping furniture, but it’s a messy job. If you’ve never done it, ooooooh boy, you’re in for a real treat for your first stripping job! HA! “Messy” isn’t even half of it! So because of that, sometimes I just like to use an orbital sander to strip a top. This is possible when it’s flat and you don’t have any curved areas or cracks and crevices. The edge of this vanity, though, I decided to use a chemical stripper. Using an orbital sander on the edge of furniture is waaaaay too harsh. Trust me, I’ve learned this the hard way! The next thing you know, you’ve totally changed the edge of the furniture and it looks all sloped and wonky! 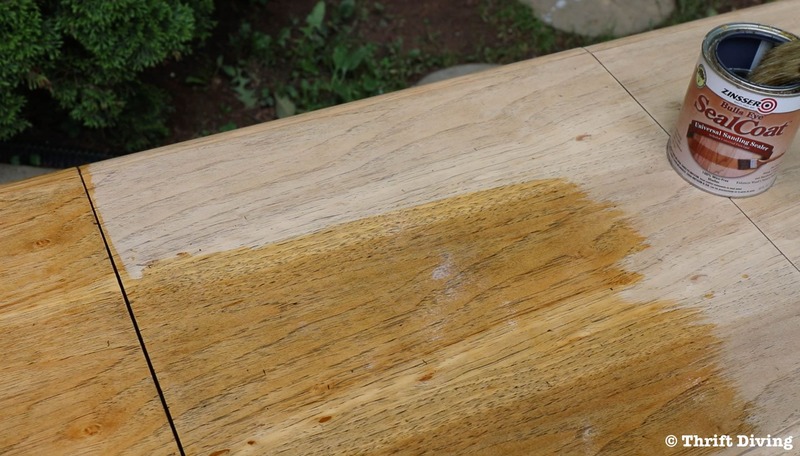 With the stripper, I could gently remove the old topcoat and stain, use a wire brush to further loosen it up, and use After Wash to help remove the build-up. I sanded the top and edge both (watch the video for details) and it looked great afterward! 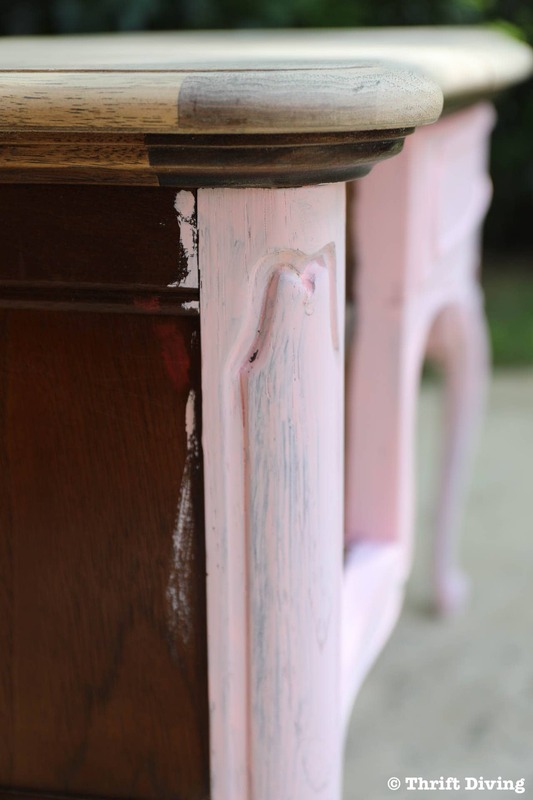 For this project, I mixed my own batch of pink paint by Black Dog Salvage. I bought the chalked paint from Woodcraft, but you can also buy their I Need a Bandage (red) and Clean Canvas (white) on Amazon. 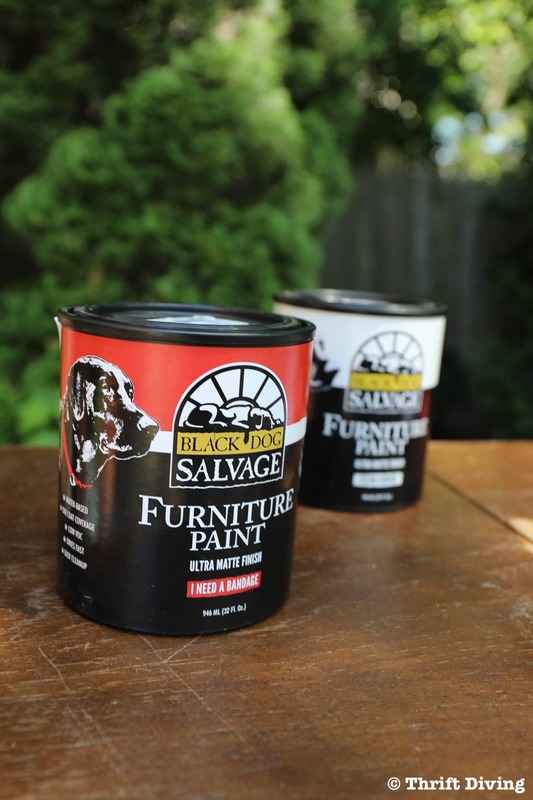 I have used their paint before when I did that vintage Chromcraft reupholstered chair makeover and I loved it. They don’t sell the shade of pink I was looking for, so mixing my own was the next best option. Most people think you have to sand and prime furniture before painting. Nope, not true. I will say, however, that because you haven’t sanded or primed, you’ll end up adding two coats of paint anyhow. The first coat will look like crap, especially if you have dark wood. And you’ll be wondering if you did something wrong. You didn’t! It’s just that you need to add more coats. I typically do 2-3 coats when I paint furniture. I will say this: use a small 1/4″ nap roller if you can! It will go much faster, and you won’t get the brush strokes! After not having painted furniture for awhile, I found myself getting a little frustrated that it didn’t go faster with that small brush. Next time, I’ll have some rollers on hand!! Last year I discovered this thing called sanding sealer. 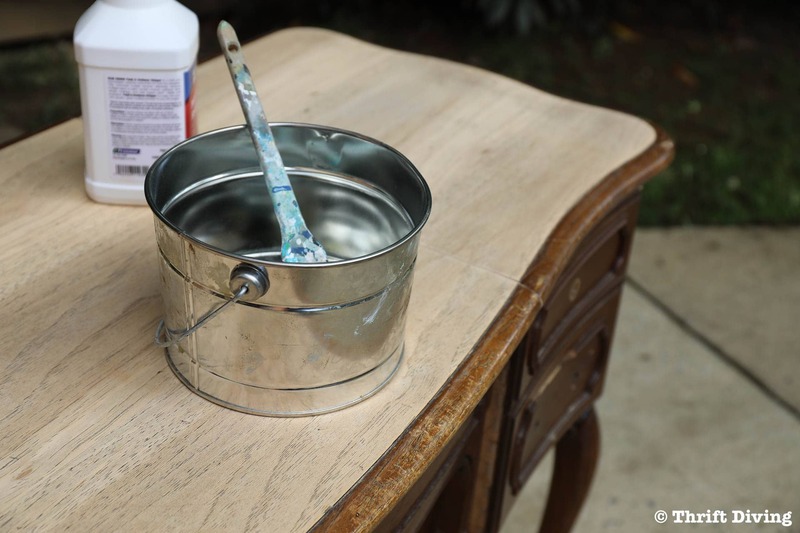 It’s really a fabulous product because it can be a sealer between layers of dyes and top coats, sands well, and can add just a hint of color to a piece of wood. 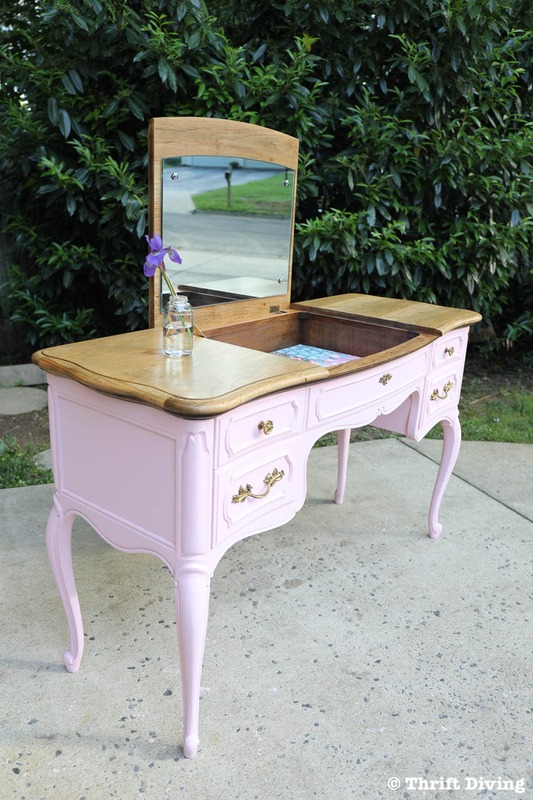 In this case, I decided to use it to add a hint of color to the oak top of this French Provincial makeup vanity. Once the sanding sealer dried, then I added a couple coats of General Finishes High Performance top coat. It dries really quickly and I find it the easiest top coat to use. Plus, it gives really amazing results. Soooo smooth and satiny! 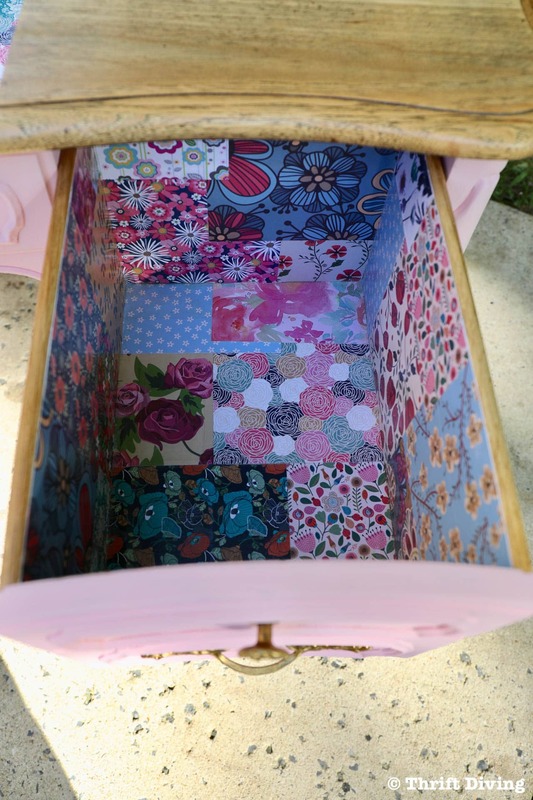 This was the most fun part of the project: adding pretty scrapbook paper in a patchwork pattern to the drawers! …but when you open the drawer, you see this instead! Doesn’t that make you happy? Because it sure makes me smile! 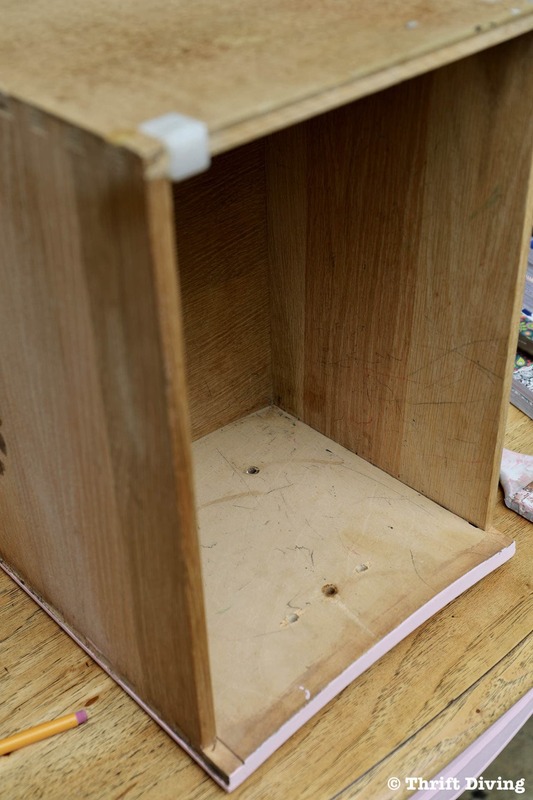 I will have a separate post and video on how to line drawers with scrapbook paper, because there are a few tricks to doing it well and getting that crisp, clean line! Watch out for that tutorial soon! 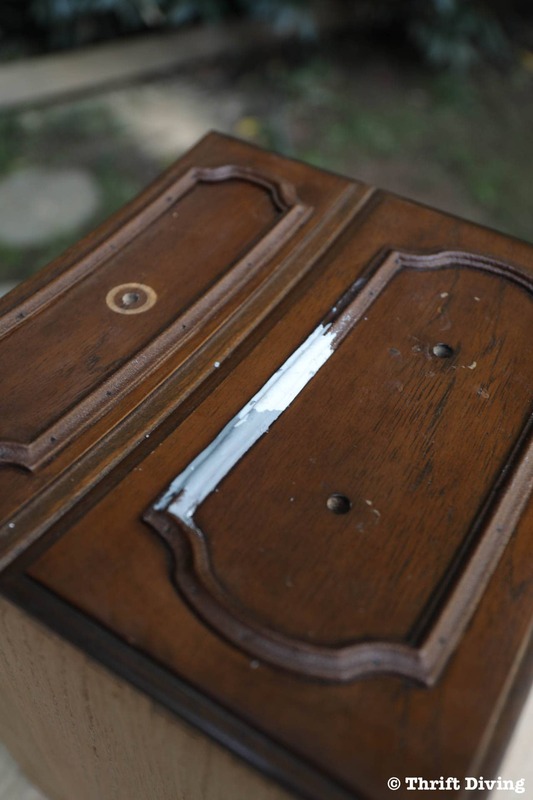 I absolutely love Rub n’ Buff on old tarnished handles and pulls! In case you haven’t priced knobs and pulls lately, they ain’t cheap, honey. Using what you’ve got, but just cleaning them up a bit, is the way to go! 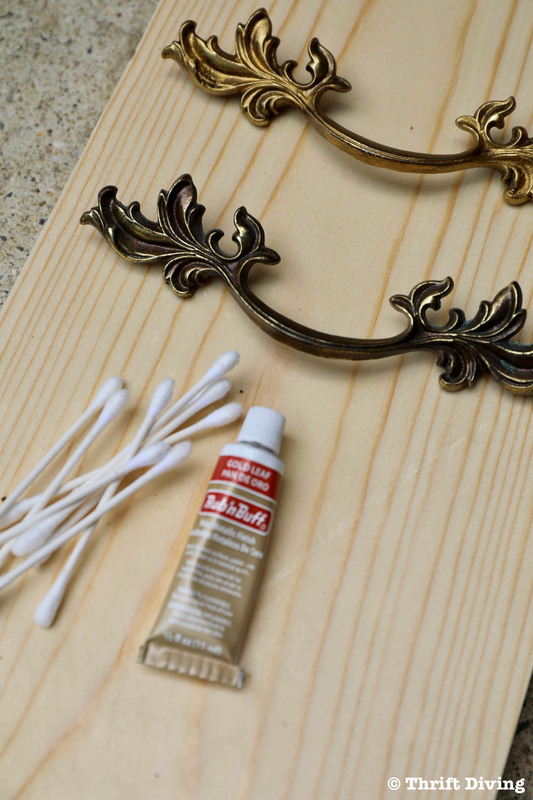 Rub n’ Buff, a wax metallic finish, is the best way to do that because it looks more natural than spray paint. It doesn’t leave that thick coating that spraypaint can leave. Aren’t these French Provincial handles gorgeous?? I didn’t do this step yet, because I want the paint to cure a bit first, but yeah, I plan to put some General Finishes High Performance Top Coat on the paint. I don’t really like using wax because it has to be reapplied (which I never do….) and I don’t think it adds enough protection for paint, especially if it’s something that you rub against, like your leg again the side, etc. The top coat (maybe 2 coats) offers much more protection. I love the Satin top coat! 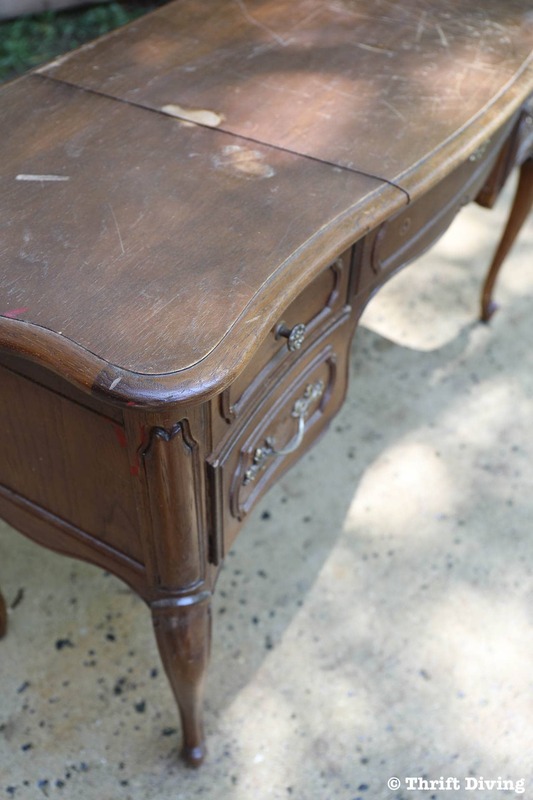 Let’s take another look at this BEFORE and AFTER French Provincial vanity makeover! That top is to die for! I love how satiny it looks and feel. I’m really glad that I went in that direction and kept it natural! « The Outdoor Overhaul Makeover Challenge Reveals! Beautiful job, lovely piece. The bonus is…you are so fun to watch. I love how you restored this piece! So glad I found you on YouTube. I think it was random. Have you ever been on Hometalk? That sure is a soft, pretty pink. Doesn’t look like a $10 find anymore!!! I LOVE it! You created such a beautiful feminine piece of furniture. Now you need to find a round ottoman maybe with a boho feel to it. Ooh, I love that idea of a round ottoman! I need to look for one at the thrift store. Even better, I wonder if I could make my own! Hmmm….. Thanks, Mary! Love it! Great job. Love the pink. 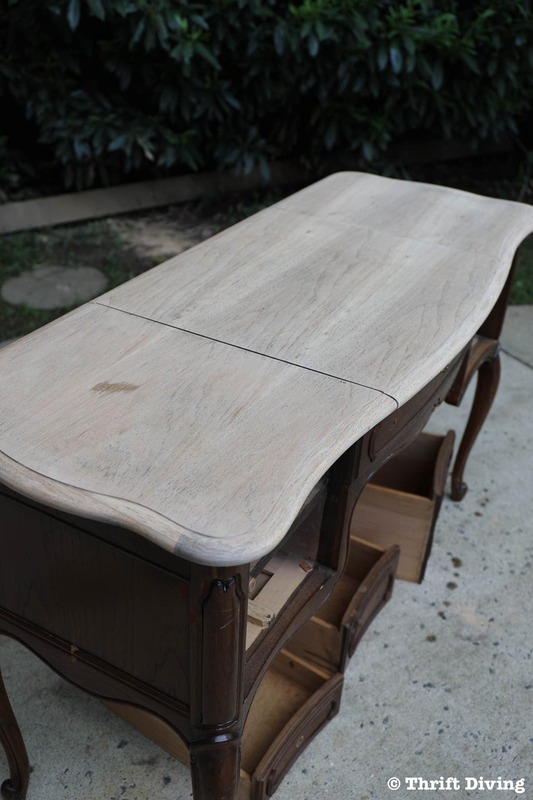 I have this same French style desk……. the exact same one. I am sitting at it right now. I love mine. It sits proudly in my French themed home office. I purchased mine about 10 years ago….. also at a thrift store. I paid a bit more but mine was in perfect condition. I didn’t have to do anything to it except paint it. I painted it white, stained the top with a walnut stain, lined the drawers and distressed the white just a little bit. Hope you enjoy your desk as much as I do mine. 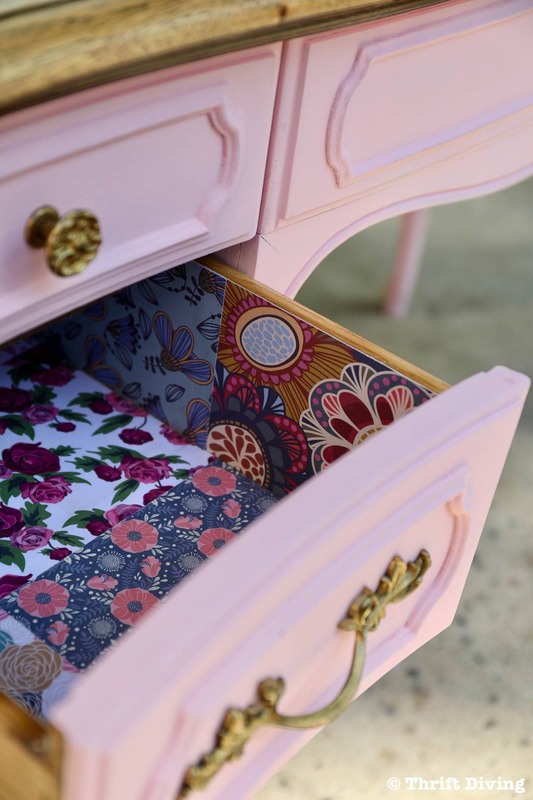 I was hoping it would not be too pink & I love the details added to the drawers. Your work is beautiful. I have been reading your blogs for some time. You have inspired me to tackle DIY projects. I was very hesitate but tackled 2 projects. The first one was so so, the 2nd ok. My next project will be a dresser that I’ve had since I was a child (I’m 63) and it’s been used by various family members and now it’s back in my possession and I will use it as a lingerie chest. Thank you for sharing your work. Absolutely love it! Great job Serena! Lovely! I hate seeing a “good” piece of old wood furniture turned into something tacky or cartoonish. This is perfect. 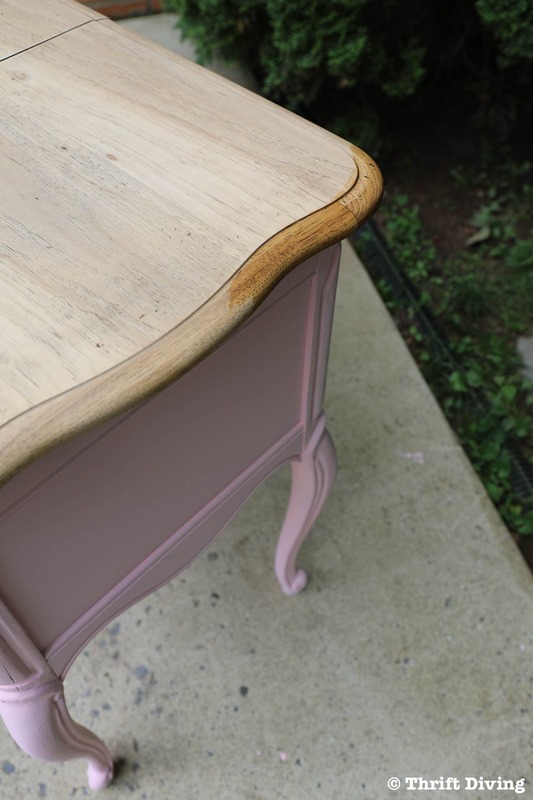 The pink really complements the color of the top wood and the drawer pulls. The paper inside is of course easy enough to cover up if someone prefers a different look inside. But in this case it does fit the theme with the mirror inside and the pink outside. 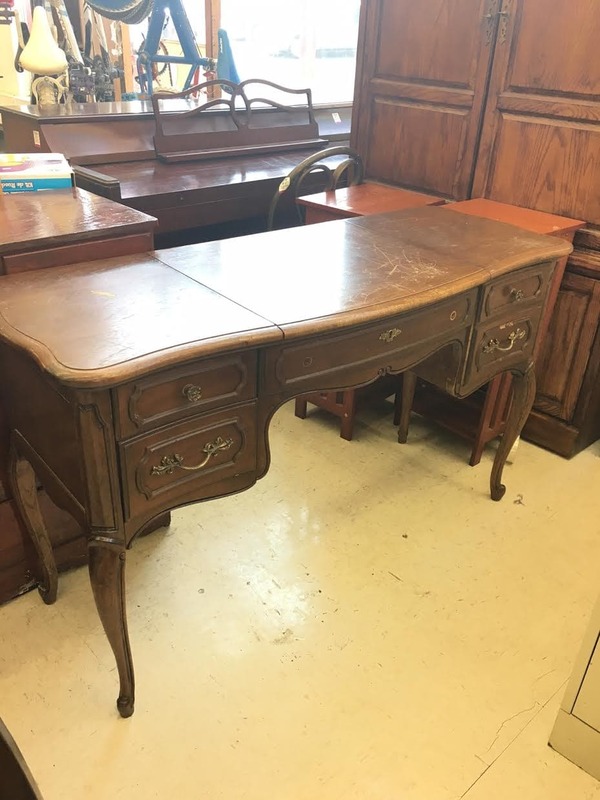 What a wonderful vanity this would make!